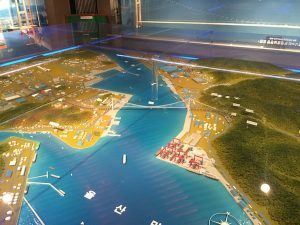 On January 12th, GLCM toured the city hall and public resource center in Ulsan as well as the new single-span suspension bridge that will be a new national landmark of Korea. In 1965, Ulsan became an industrial city, primarily by governmental forces. The city is very famous for its rock formations and carvings. Currently, Ulsan’s GDP rivals that of Northern European countries at about $80,000 per capita. The written history of Ulsan dates back to 3 BC, many years before it would come the economic power house it is today. Last year, Ulsan celebrated its 600th anniversary. It has only been 30 years since Ulsan built its first airport. 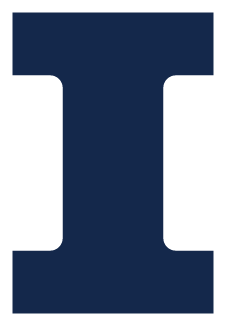 In 1974 Hyundai Heavy Industry (HHI) was founded in Ulsan. It reached 10 million annual exports in 1992. In the early 1980s, all of the fish died in the Taewah river due to pollution. People have also died swimming in this river. The water became so bad that it was classified as Grade 6; some citizens started to move away to escape the awful pollution. Thankfully now, many species that were once gone have now returned to Ulsan. In an effort to return the prospering city to its once diverse ecosystem, the local government has put in place many campaigns to help restore its ecosystem. Ulsan is now being referred to as an urban ecopolis. In addition, in 1964 Korea’s first oil refinery opened up in Ulsan; then in 1974 shipyards began to be built all over Ulsan. 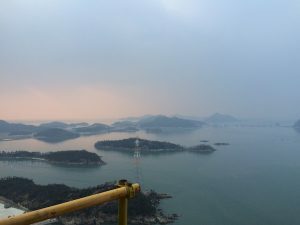 Today, approximately one half of the oil that is refined in Korea is refined in Ulsan. Some of the programs the government of Korea is implementing are electric and hydrogen fuel cell cars. Korea is now heading towards being a global leader in environmental sustainability. Ulsan has also been called the “Mecca” of modernization. Some companies are even changing their main office locations from Seoul to Ulsan. 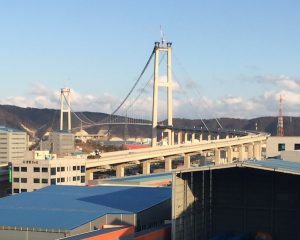 The new Ulsan Harbor suspension bridge is located at the vanguard of greenburough on the city’s East coast, and is being construction by Hyundai Construction. It will be Ulsan’s equivalent to the Golden Gate Bridge in San Francisco. The bridge will be 5,615m long plus adjacent road additions with three tunnels. The main span will be 1150m in length and is set to finish in June 2015. One of the main goals of the project is to reduce the traffic congestion of downtown Ulsan and to drive the development of the growing city. The bridge will also allow 2 way barge traffic. The suspension cables will implement super high strengths with a tested tensile strength of 1960 MPa. One grouping of cable consists of 59 individual strands which consist of 127 wires. On the other side of the bridge, there are 64 strands instead of 59 due to the differing angle of the main cable. The tallest pylon will tower at a height of 203 meters above sea level. One of the most unique aspects of the project is the combination of gravity and tunnel type anchorage points. The tunneling anchorage system is relatively new and takes advantage of frictional forces along the length of the bored tunnel and uses 1/3 of the concrete when compared to the gravity anchorage. The bridge will be the largest single span bridge in Korea and the 3rd largest single span in the world. 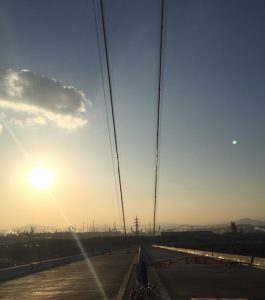 One of the driving reasons for the bridges construction is that it directly connects the largest districts in Ulsan.